How do I explain my feelings about visiting Ohio? It’s different. The Amish in Holmes County, Ohio are different. Not in a good or bad way. Just…different. Fans of books about the Amish might be surprised to learn that there are different types of Amish: Swartzentruber, Dan, Old Order, New Order, Nebraska, etc. Some of those groups are located in one particular geographic area. Other groups are spread out over different states. What I have learned is that one type of Amish can be dramatically different from its counterpart in another geographic region. And this has thrown me off-balance. There are little things that are obvious even to the casual observer such as the Old Order Amish (OOA) from Holmes County wear stiff, cup-like prayer kapps while the OOA from Lancaster County were softer heart-shaped ones. But when you really begin to talk to people, you certainly learn that there are many layers to the different geographic regions. The one thing that I have learned is that no one person knows “the” Amish. Not even someone who grew up Amish can know all there is to know about the Amish. It’s impossible because the rules change between church districts, religious leadership, and county lines! While I know a lot about the Amish, my knowledge is limited to those church districts in one particular area of Lancaster County. Being in Holmes County and meeting so many different people, I have truly been humbled by the things that I have learned. I’ve learned about the many different groups of Amish in this area. I’ve learned that OOA in Holmes County live in much more modern homes than in Lancaster. I’ve learned that an awful lot of Amish youths seem to leave the church in Holmes County or, alternatively, choose to belong to a less conservative group. I’ve also heard some stories that are not mine to tell. Yet, I shouldn’t be surprised. I’ve heard a few stories from my friends in Lancaster about the infiltration of the ugliness that surrounds the non-Amish world. I’ve heard of a baby born after just seven months of marriage or a teenager abusing illegal substances. Several Amish people I’ve met suffer from depression or have unhappy relations within their families. Overall though, in Lancaster, I’ve also met some of the kindest, happiest, and fun-loving people from the Amish communities. I’ve seen the sparkle of love in the eyes of a husband as his wife pours his coffee. I’ve heard the beauty of a congregation singing hymns on a crisp Sunday morning. And I’ve felt the love among the people for each other. Simply put: they are human. Like every other person in the world, the members of the Amish church are people first. Some of them follow a straighter path than others. Some decide to leave the Amish community for a variety of reasons. They are no different from non-Amish people. These similarities with the rest of the world are often not discussed in literature. I know that I have hinted at these topics in my earlier novels only to have several readers become upset. And I agree. 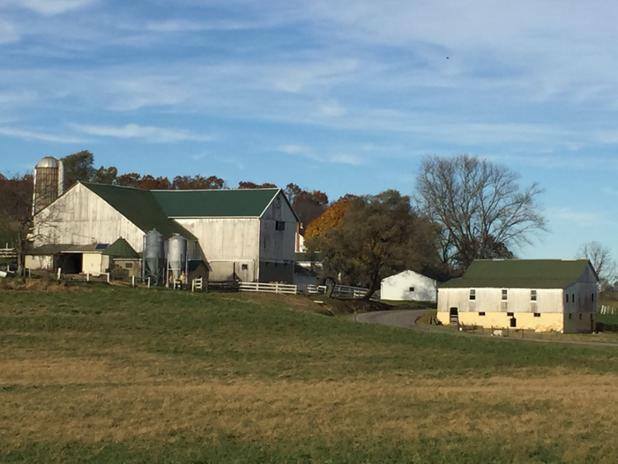 It is upsetting to realize that the Amish community—the very people that we respect and love so much—are just as physically and spiritually fragile as the rest of us. Yet, like I said above, we shouldn’t really be surprised. The Bible tells us “For all have sinned and fall short of the glory of God…” (Romans 3:23). That means you. That means me. And that means the Amish, too. I found your comments on Holmes County quite interesting. My husband and I have spent time there over the last several years. We stay in Berlin and visit many places over the area. I also love your books and am anxiously awaiting Book 5 in the Plain Fame series. Here around Clark, Missouri the Amish are Old World. They don’t use anything with wheels unless they are hard wheels. Much more strict than other communities, yet we have hired them to roof our house twice. The youth working for the main Amish man showed me how to program my car to get back to their houses. I have wondered how they knew this. They each told me they had not gone on a Rumspringa. Our kitchen cabinets were made by an Amish woodworker and we are now waiting on our bathroom vanity and linen closet from the same gentleman. Such great workmanship!! I do wonder how is is going to order us a vanity top. I have to decided on the color and then I will go visit him again. We almost bought a house right next door to him. It was one of 2 English houses in the area, but it needed too much work.? Thank you for posting this information about the Amish. Of course they are human and I would not be offended by reading a fiction book that included these real-life problems. I love your books and I am fascinated with the Amish culture in general, imperfections included. Loved your article. I started going to Shipshewana IN many years ago and then have gone to Lancaster PA and also have been to Holmes Co Ohio 4or 5 times. We meet a couple nkn Amish she worked at the Comfort Inn and her husband a minister who took people on tours. He used to be a social worker with the Amish I believe. Learned a lot and have done a lot if reading on the Amish plua love the fiction books. ThevAmish have their issues but I love to observe them and admire their lifestyle. I grew up in Ohio near Amish country. I took for granted being in a check out line with them or watching to take care when passing a buggy. I live in Texas now and miss being around them. I would like to share with you a real story. My milk went bad and I could not feed my daughter. She had a bad reaction to the formula. Our Dr suggested goats milk. I started going to an amish farm to purchase it. After going there for several weeks they asked what I was using it for. When I explained they refused payment and I started finding it on my porch each morning. What beautiful people they are. Also when my daughter was about 3 months they asked if I would object to receiving mothers milk? Which I gladly accepted. They are a Godly people. Sugarcreek is a wonderful area. We are all in danger of putting people on a pedestal — be it the Amish, an Evangelical, a celebrity, an author or just a close friend. I remember years ago when a Christian singer had an affair. It was shocking — unheard of. It just shouldn’t have happened. Well, that is true. But what makes us think that that person is any less vulnerable to the Enemy’s arrows than we are? If anything, they may be even more susceptible. True, we all fall short — and therefore we all must remain vigilant. We live in a fallen world, and until Christ returns, we will battle sin. You amaze and inspire others with your many talents and successes. Enjoy your uplifting personality and ability to display that we all have imperfections in ourselves and within our family unit.